You can never have enough glittery/shimmery top coats. I think my Helmer drawer for my special top coats is almost full! Golden Enchantment was a color I had wanted, but I wasn't necessarily in need of it. Thankfully, Sally's had these on sale which pushed me to get it. I'm thankful I did because it's a pretty one! This is Golden Enchantment layed over NYC Black Lace. It's a golden holographic microglitter in a clear base. It really adds dimension to a polish. I love how over black it looks like space splattered with stars. As a nerd who likes astronomy this is plus! This would look great layered over anything. There are no limitations! I was also tagged by the lovely Lacquer Ware for Tips and Toes for this neat little survey! 1. Have you ever felt so disappointed in a nail polish you wanted to throw it out the window? And why? Yes. I even blogged about it Misa Fleeting Hibiscus. 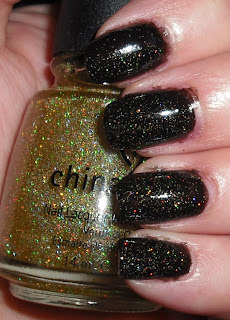 I saw one swatch of it online and it looks like a really pretty shimmer. It ended up being a really pastel pearl pink stomach medicine ugly color. It looked awful on my skintone. Blech. 2. What are your top three favorite nail polishes? Geez, this is hard. Probably...Zoya Elke, China Glaze Strawberry Fields, & Orly La Playa....and dozens of others. 3. What is your favorite online store? 4. Is there anything you'd like to share with us that you haven't shared before? Sorry, this isn't interesting, but I don't really think I have anything new to share. The only stuff I don't share on the blog really are religious views, political views, and etc for obvious reasons. I'm a pretty liberal person as far as human rights and I'm very outspoken about it in real life. I think discrimination and hatred because of someones religion,race, sexual preference, & etc is incredibly destructive and wrong. I'll leave it at that, though I can imagine a majority of you will agree with me. 5. What is your favorite song of the moment? I tag anyone who would like to do this survey! P.S: If you commented on this post earlier and your comment is no longer viewable, it's because I was testing that new comment system and it removed the previous comments. I didn't remove them on purpose. I decided not to use this comment system, so it's back to normal now. I do like that layering lacquer. It is pretty and looks excellent with the black and I bet it looks good with other colors too. oooh i like this goldy over black..i need to experiment with layering more.. I adore this color- next time I go to Sally's its mine!!! I have a giveaway going on I thought you might be interested in entering on my blog, and to all of your other readers, please feel free to enter as well!! Thanks! Hope to see you on there!! And I'm sorry I never even asked you if it was okay to call you Steph- I know a few people that it bothers to have "nicknames" so my apologies... Stephanie. I quite like this tc but I'm not really liking it on the black...maybe something less harsh like a pink?